The deadliest woman in the galaxy gets a ‘Puzzle Quest’ upgrade! Looking to add more cosmic Marvel heroes to your “Marvel Puzzle Quest” roster? Well Gamora’s rounding out the 4-Star Guardians of the Galaxy team, sword in hand, ready to slice and dice anyone unlucky enough to get in her way. D3 Go! Senior Producer Josh Austin gave us the rundown of the deadliest woman in the galaxy’s new variation and all her awesome abilities. Marvel.com: A new 4-Star Gamora is slashing her way into the game. What kind of upgrades are we looking at for one of the toughest fighters in the known universe? Josh Austin: Gamora (Awesome Mix Volume 2) is the only character in “Marvel Puzzle Quest” that can instantly down any character! That and her first ability delivers good damage for a 4-Star character that first deals damage to a target opponent and creates a Countdown tile that continues to deal damage each turn to the targeted opponent. Marvel.com: Let’s talk about her kit. What is this new Gamora all about? Josh Austin: Gamora’s first ability is called Deadly Strike and it costs 10 Red AP. Gamora uses her sword to swiftly strike the enemy landing a deadly blow. This power deals damage to [the] targeted character and creates a Red Countdown tile that deals damage each turn to the targeted character. The second power is called The Most Dangerous Woman and it costs nine Black AP. Here is the power where Gamora uses her sword to take out her opponents permanently! This power creates Purple Attack or Strike tiles and has a Passive that at the start of the turn, if all the Purple tiles are friendly specials tiles, Gamora removes them and downs the target. Gamora’s last power is called Incapacitate and it costs six Blue AP. Gamora knocks out the enemy, giving her allies an opening. This power stuns a target opponent and has a Passive that whenever an enemy is Stunned, creates a Purple Attack or Strike tile. Marvel.com: So she can literally take out any enemy, with any amount of health, with The Most Dangerous Woman? And filling every Purple tile, just how easy is that to pull off in a match? Josh Austin: Gamora can take down any character in MPQ! The fun of this power is finding teammates that will help the player initiate this power. The Most Dangerous Woman power that the player uses AP to initiate already brings out at level one, four Purple Attack or Strike tiles or six, at level five. Team her up with people that remove enemy Special Tiles and/or help stun the enemy when getting the board ready for The Most Dangerous Woman and you have a great chance of destroying the enemy. Josh Austin: Definitely want people that will help contribute to the events that can trigger The Most Dangerous Woman’s passive. This includes Ant-Man (Scott Lang) with his Pym Particles. There are also characters that remove enemy Special Tiles like Kamala Khan (Ms. Marvel) and Quake (Daisy Johnson) either separately or even together since they use both Purple and Blue to eradicate Purple basic tiles. Marvel.com: And how are we building her? Where are you putting the points in her covers? Josh Austin: For me, I’m still building my other characters, so I’d probably go with 3/5/5 so I could get the most out of creating Purple tiles and that stun with her third power. However, if I had more decked out characters I would go with 5/5/3 so I could rely on other characters for the stun and have that damage that comes from Deadly Strike since it delivers a good amount of damage! Marvel.com: Is there anything else we need to know about the baddest swordswoman out there? Josh Austin: Gamora (Awesome Mix Volume 2) goes live on Thursday and is a placement reward for the Hearts of Darkness event. She will be available in the Vault for The Hunt that runs between May 21-26. She will also [helps] conclude the three part Guardians story event called Plan C that will run between May 25 and 30. And finally, her Versus Tournament is called Sworded Affairs and runs between May 25 and May 29. 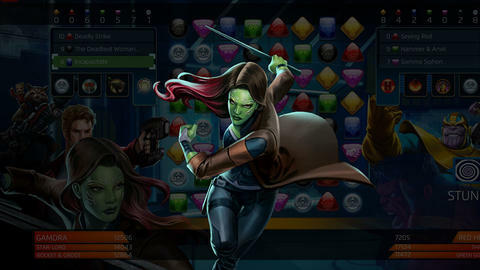 Unleash your inner Gamora here and stay tuned to Marvel.com for more “Marvel Puzzle Quest” news and interviews.